MADRID — Felix Auger-Aliassime knows he'll get into one main draw of an upcoming ATP Tour Masters 1000 event, but he's playing the waiting game on the next big men's tennis tournament. The Madrid Open announced Monday that the 18-year-old Canadian has been granted a wild card into the event, May 5-12. 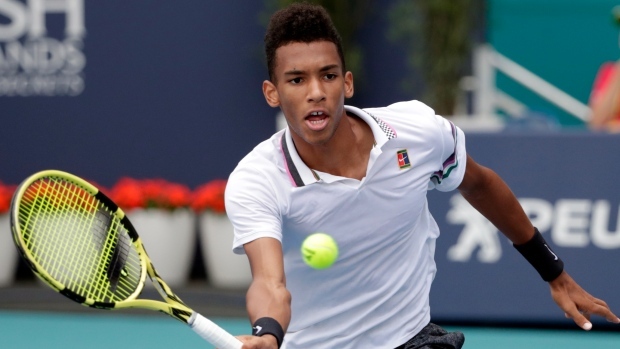 However, Auger-Aliassime doesn't know yet if he'll get a wild card into the next Masters 1000 tournament, the Monte-Carlo Masters, April 14 to 21. While Auger-Aliassime jumped to No. 33 from No. 57 in Monday's world rankings after reaching the semifinals in Miami last week, entry deadlines for tournaments are weeks before play actually begins. Because of that, Auger-Aliassime didn't get direct entries into Indian Wells (where he got a wild card), Miami (where he qualified), Monte Carlo or Madrid. The Masters 1000 events are considered to be the top tournaments outside the four Grand Slams and the ATP Finals. Auger-Aliassime is fourth on the alternate list for Monte Carlo, so there's still a chance he gets a main-draw spot through dropouts. The Madrid tournament, meanwhile, put out a press release to announce their decision on Monday. "Felix is an incredible player," Feliciano Lopez, director of the tournament, said in a statement. "Everything he is doing at 18 years of age is astonishing. He has a spectacular future, with a practically limitless range of shots. He earned his invitation to play in the main draw through his results early this season. I'm sure he will do well." Auger-Aliassime and fellow Canadian teen Denis Shapovalov helped Canada win the Junior Davis Cup in Madrid in 2015. "I can't wait to get back to Madrid," said Auger-Aliassime, who has returned home to Montreal this week. "I have great memories of my junior career in the Caja Magica, where I hope to produce some more magic."